Star Painting LLC has years of experience bringing painting services for homes in businesses in Rickreall, Oregon. Our team takes pride in delivering high-quality work and is committed to 100% customer satisfaction for every job we do. Get your painting done by an award-winning painting company. Since so many towns comprise greater Salem, it only makes sense that our painters offer their services to these communities. Rickreall, though tiny in size, is massive in reputation. Eola Hills Winery lives here, one of the most renowned and visited wineries in the Willamette Valley. They hold dozens of weddings and wine tasting events every year and offer a welcome respite for cyclists and bikers on wine-country tours. 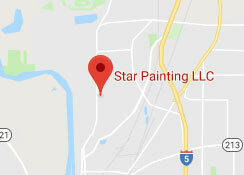 Star Painting LLC is an award-winning local business – known for finding creative solutions for home and business owners intent on creating the best living space possible. Whether it’s for a long-term aging-in-place project or a short-term curb-appeal pursuit, our professional painters serve Rickreall in addition to many other areas surrounding Salem.